Galaxy Thermoplast Pvt. Ltd. is one of the lead exporters and distributors of PFA Lined Ball Check Valves. They are a pioneer in their field and have gained immense recognition in the market. The variety that they offer as well as the numerous services make the customers feel like their needs are being taken care of. SS 304 PFA Lined Ball Check Valves use a free-floating or spring loaded ball resting in a seat ring as the closure element. The mechanics of MS FEP Lined Ball Check Valve operations are relatively simple as compared to other fittings. FEP/PFA Lined Check Valves contain a ball that sits freely above the seat that has only one through-hole. SS 316 PFA Lined Ball Check Valves are best used for services with viscous fluids or when there is sediment in the system because the ball remains clean with smooth operation. High Quality PTFE Lined Ball Check Valve, Manufacturer of Comprehensive Range PTFE Line Ball Check Valves, Lined Ball Check Valve, Perfluoroalkoxy Lined Ball Check Valve, SS 304 PTFE Lined Ball Check Valve, PFA Lined Ball Check Valve, PTFE Lined Ball Check Valve, SS 316 PTFE Lined Ball Check Valve Supplier in Mumbai, India. PTFE Lined Ball Check Valve Manufacturer, Polypropylene Lined Ball Check Valve, PTFE Lined Ball Check Valve Price, Largest Stockist of FEP Lined Ball Check Valve, PTFE Lined Stainless Steel Ball Check Valve, Teflon PFA Lined Ball Check Valve, Dealer & Distributor of PFA Lined Ball Check Valve, MS Lined Ball Check Valve in India. 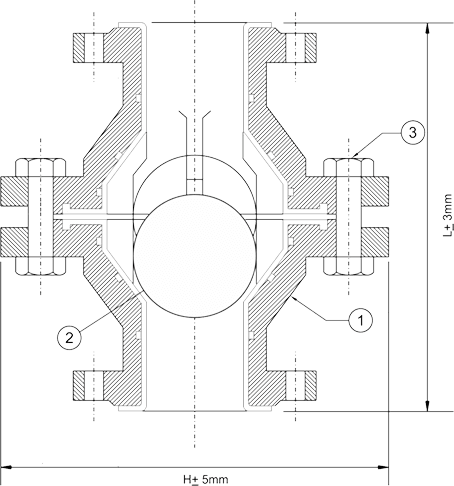 FEP/PFA Lined Ball Check Valves are advantageous is several ways. They can be used with gas, steam, air, water and vapour lines with high flow velocities. MS FEP Lined Ball Check Valves can be installed in lines with a vertical flow. They are also available with renewable seat rings. Galaxy Thermoplast Pvt. Ltd. commits to not compromise on quality, competitive pricing and responsive after-sales service. The range of FEP/PFA Lined Ball Check Valves provided by them, satisfy the customer’s requirements in its entirety. We are Experts in Exporting SS 304 PTFE Lined Ball Check Valve in India, Mexico, Thailand, Oman, United Arab Emirates, Australia, Belarus, Puerto Rico, Ghana, France, Belgium, Macau, Nigeria, Ecuador, Spain, United States, Philippines, Bangladesh, Iran, Brazil, India, Yemen, Russia, Jordan, Canada, Denmark, Lithuania, Estonia, Kuwait, Tibet, Ukraine, Croatia, Nigeria, Mexico, Mongolia, Chile, Zimbabwe, Morocco, Germany, Norway, Italy, Angola, United Kingdom, Bolivia, Poland, Bulgaria, Nepal, Gambia, Hungary, Iraq, Finland, Saudi Arabia, Sweden, New Zealand, Slovakia, Lebanon, Iran, Bhutan, Chile, Costa Rica, Switzerland, Bahrain, Singapore, South Africa, Romania, Kazakhstan, Trinidad & Tobago,Tunisia, Taiwan, Venezuela, Ireland, Afghanistan, Serbia, Austria, Colombia, Gabon, Portugal, Vietnam, Greece, Azerbaijan, Czech Republic, South Korea, Egypt, China, Malaysia, Sri Lanka, Netherlands, Kenya, Namibia, Turkey, Poland, Algeria, Peru, Pakistan, Argentina, Japan, Hong Kong, Libya, Indonesia, Israel, Qatar. We are Experts in Suppling MS FEP Lined Ball Check Valves in India, Sydney, Dubai, Mumbai, Lahore, Dammam, Haryana, Baroda, Gurgaon, Sharjah, Faridabad, Noida, Howrah, Mexico City, Visakhapatnam, Jaipur, Ahvaz, Secunderabad, Port-of-Spain, Toronto, Perth, Bogota, Pimpri-Chinchwad, Coimbatore, Milan, Ranchi, Manama, Rajkot, Kuwait City, Hong Kong, Madrid, Houston, Riyadh, Jamshedpur, Kuala Lumpur, Ernakulam, Edmonton, Colombo, Los Angeles, Istanbul, Chennai, La Victoria, Thane, Busan, Bengaluru, Hyderabad, Brisbane, Navi Mumbai, Hanoi, Nagpur, Caracas, Ulsan, Kanpur, Tehran, Melbourne, Seoul, Thiruvananthapuram, Bhopal, Surat, Chiyoda, Calgary, Santiago, Atyrau, New York, Abu Dhabi, New Delhi, London, Singapore, Doha, Algiers, Ludhiana, Moscow, Muscat, Vadodara, Ahmedabad, Kolkata, Gimhae-si, Al Khobar, Aberdeen, Ho Chi Minh City, Ankara, Al Jubail, Rio de Janeiro, Chandigarh, Montreal, Vung Tau, Bangkok, Indore, Jeddah, Dallas, Petaling Jaya, Karachi, Lagos, Jakarta, Geoje-si, Pune, Nashik, Cairo, Granada, Courbevoie.